« New Jersey’s considering a nuclear bailout. Here’s why we don’t need it. Our paper confirms that, in Texas, residential solar panels uses less water and pollutes the air less than using the central-grid power (based on its electricity sources during those years), and driving an EV instead of a gasoline vehicle generally reduces the household’s water and emission footprint, even though EVs charge from the grid. Moreover, our analysis demonstrates how carefully examining energy-use data can help us make sure we’re maximizing clean energy’s benefits. People may know that burning fossil fuels – whether to create electricity or drive gasoline vehicles – emits gasses that pollute the air. But you may ask, how do the central electric grid and cars use water? Solar panels and electric vehicles will help pave the way to a cleaner future, but we must dig into the details to ensure we maximize the environmental benefits. Water is used to produce many forms of energy, including both fossil-fuel based electricity and gasoline. For electricity generation in a natural gas or coal plant, large quantities of water are used for process-related needs, as well as to cool the power plant. The production and refinement of gasoline also uses a lot of water; in fact, we calculate that it takes about 4 gallons of water to produce one gallon of gasoline. Wind and solar PV, on the other hand, need virtually no water to create power, and they do not emit GHGs or other pollutants in the process. Because solar panels consume no water and emit no pollution, installing a solar panel allows a household to reduce both the water use and air pollution associated with grid electricity. In fact, we find that solar panels in Texas have a very large and positive impact on both water and GHG emissions, reducing a household’s combined footprint by about 75 percent (a previous Pecan Street study also found solar panels reduce homes’ water-intensity by approximately 79 percent). In Texas during the day when the sun shines, the main power sources are natural gas and coal. So, if you’re getting some or all of your power from your own solar panels, you’re avoiding using that high-GHG emitting, thirsty electricity from the grid. Importantly, we find that a household can improve its environmental footprint even further by facing its solar panels south, capturing more sun throughout the day. However, this can conflict with local electric system attempts to maximize production during periods of peak demand, generally in the afternoon when people are getting home from school and work. 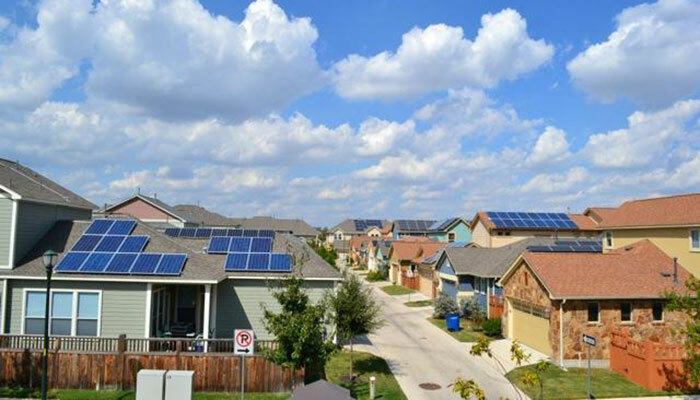 For example, Pecan Street provided subsidies for solar owners in their community who face their panels west, thereby generating more electricity during that afternoon period, but less overall over the course of the day. Less electricity from the solar panels overall means more water use and emissions from the central grid. This contradiction highlights the importance of analyzing data. A better understanding of hourly energy usage and emissions can inform electric system policies and pricing that lead to a reduction in total costs, including those related to the environment. Understanding electric vehicles’ environmental impact by these measurements is a bit trickier, because EVs avoid gasoline (thereby reducing water use and GHGs), but they also charge using the grid, which in Texas is largely powered by fossil fuels (thereby increasing both water use and GHG emissions). Our paper therefore tested whether, on net, EVs are good for the environment – in this case by reducing water use and GHGs – in Texas. To be able to quantify the environmental benefits of EVs, we needed to think about what vehicle the household would have driven had it not purchased an EV. Vehicle owners have many choices in the marketplace, and fuel efficiency is not the only deciding factor. For example, a family with many children or someone who needs to haul a trailer may not be willing to trade off vehicle size or horsepower in favor of a more compact EV. On the other hand, a person who likes small cars may place greater weight on fuel efficiency; this person’s alternative to an EV is more likely to be a hybrid, whereas the large family’s alternative vehicle is more likely to be a minivan. Understanding what the alternative choice would have been is key in measuring the environmental impact of an EV: the less fuel-efficient the alternative vehicle, the better the EV is for the environment. For example, if you switch from driving a gas-guzzler to an EV, that’s more beneficial than someone switching from a hybrid. In fact, we find that if the household’s alternative-choice vehicle is a hybrid, using an EV can actually increase its net water use – the reduction in gasoline use is very small due to the high efficiency of the hybrid, and the EV is charged with thirsty grid electricity. That said, we find that EVs always reduce GHG emissions, on net, regardless of the alternative vehicle. Although the benefits do vary largely with the efficiency of the alternative vehicle they would always increase the cleaner the grid becomes. Ensure that vehicles such as SUVs and trucks have electric offerings, which manufacturers like Tesla and Volvo are already working on. This will help steer those who require larger sized vehicles towards choosing an electric option, thereby drastically reducing their environmental footprint. When people purchase a new EV, a well-designed rebate program that pays them to surrender their inefficient vehicle to be destroyed (such as an improved “Cash-for-Clunkers” program from 2009) could lead to even greater reductions in the environmental impacts of driving. Ensure more grid electricity comes from solar and wind, thereby further improving the water- and emission-intensity of EVs. Especially as EV adoption increases, having a clean grid will help us achieve a more environmentally-friendly transportation sector. Solar panels and electric vehicles will help pave the way to a cleaner future, but we must dig into the details to ensure we maximize the environmental benefits. The more data we have and examine, the better that decision-makers can design energy programs and incentives to improve our environmental footprint. Photo source: Pecan Street, Inc. 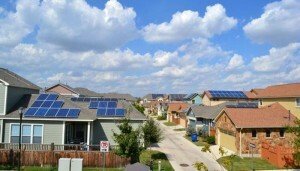 This entry was posted in Electric Vehicles, Solar Energy, Texas. Bookmark the permalink. Both comments and trackbacks are currently closed. 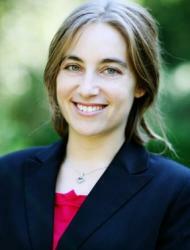 Economist, Office of Economic Policy and Analysis. Beia has recently begun to focus on topics related to domestic climate/energy policy and fisheries management policies.